☆☆☆☆ “It will likely be difficult for most people to judge ABC’s new family sitcom — starring the former cast of Roseanne, minus Roseanne Barr — on its own merits, given the ugly and unfortunate pile of baggage that comes with it. But based on the first two episodes, The Conners is an above-average family comedy with a strong cast and sharply-drawn characters that could very well exist for several seasons on their own — if, of course, the audience is able to let go of the past.” — Entertainment Weekly. ☆☆☆☆ “The character of Roseanne’s exit from the series is handled in a way that’s far more dignified and honourable than Barr-the-producer’s exit from the show. It dominates the first episode and still lingers in the fourth episode … I can’t say if I’ll be tuning in regularly for The Conners, but let the main take-away of this review be that even without Barr, the spinoff doesn’t miss a meaningful step.” — The Hollywood Reporter. ☆☆☆☆ “It’s better than might be expected after an emergency star-ectomy. 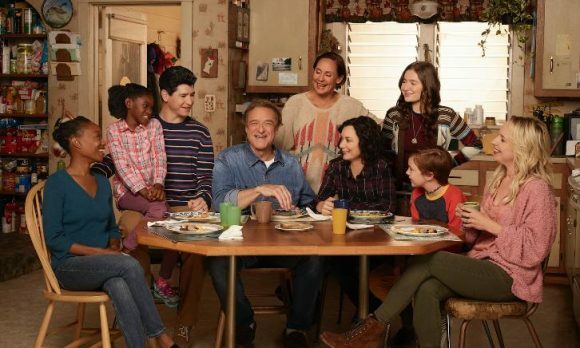 The Conners keeps much of what’s best about the original classic – the sarcasm, the blue-collar grit, topical issues and schmaltz-free emotion – as it evolves into a more traditional family sitcom, one that still focuses on the often-neglected working class.” — USA Today. ☆☆☆☆ “Barr’s lack of interest in the material last season was almost as much of a stumbling block as her behavior on Twitter, and The Conners has been liberated from both. There are enough sturdy characters and performances here to move on without her, and the premiere felt more focused than many of the episodes from the spring.” — Rolling Stone. ☆☆☆☆ “The writers have managed a reasonably deft feat in juggling comedy with drama, building a larger issue into the character’s departure, and creating new storylines for the supporting players. A subsequent episode — featuring The Big Bang Theory’s Johnny Galecki in an encore guest role as Darlene’s ex — provides further evidence of the series moving on, as well as some particularly funny stuff involving Jackie.” — CNN.